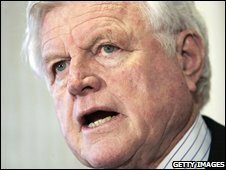 US Democratic Senator Edward Kennedy is resting and undergoing tests in a Boston hospital after experiencing what his office says was a "seizure". Mr Kennedy, 76, is conscious and talking with his family after earlier being flown from Cape Cod to Massachusetts General Hospital. His doctors have said that he did not suffer a stroke, as initially feared. The youngest brother of assassinated President John F Kennedy, he is one of the best-known Democratic politicians. He has been an active supporter of Barack Obama for the Democratic nomination for US president. His office said in a statement that he was "resting comfortably". "It appears that Sen Kennedy experienced a seizure this morning," it said. "He is undergoing a battery of tests at Massachusetts General Hospital to determine the cause of the seizure." Mr Kennedy had preventative surgery in October to unclog a partially blocked carotid artery in his neck - a condition that can lead to a stroke. But Mr Kennedy's doctor, Larry Ronan, said that preliminary tests showed that he had not suffered a stroke and was not in "immediate danger". "He's resting comfortably, and watching the Red Sox game with his family," Dr Ronan said. "Over the next couple of days, Senator Kennedy will undergo further evaluation to determine the cause of the seizure, and a course of treatment will be determined at that time." His latest illness came as the Kennedy family prepared to host a major charity event at their estate in Hyannisport. Mr Kennedy is the second longest-serving member of the Senate. He was first elected senator for Massachusetts in November 1962 - shortly after turning the requisite 30 years of age - to replace his brother, who had been elected president in 1960. Since then he has been re-elected seven times. Mr Obama, widely expected to win the Democratic nomination, described Mr Kennedy as "a giant in American political history". "He's done more for health care than just about anybody in history," he said. The presumptive Republican presidential candidate, John McCain, described Mr Kennedy as a "legendary lawmaker". Born into a rich and powerful Irish-American Catholic family, the son of Joseph Kennedy, Edward "Teddy" Kennedy became the head of the clan after the death of his three elder brothers. The eldest, Joseph Jr, was killed while flying a bomber during World War II. John was assassinated while president in 1963, and Robert was shot dead while running for president in 1968. Edward, or Teddy, as he is known, ran against sitting President Jimmy Carter in 1980, but failed, after struggling to put the infamous "Chappaquiddick incident" behind him. He had, in 1969, crashed a car off a bridge, and while he escaped, his young female passenger drowned in the water below. He fled and did not report the incident to police for over eight hours. He later pleaded guilty to leaving the scene of an accident and received a suspended two month sentence. 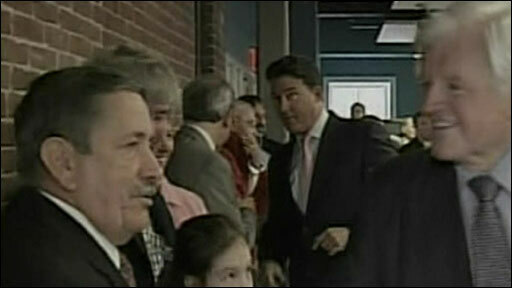 Mr Kennedy is also the father of Congressman Patrick J Kennedy.